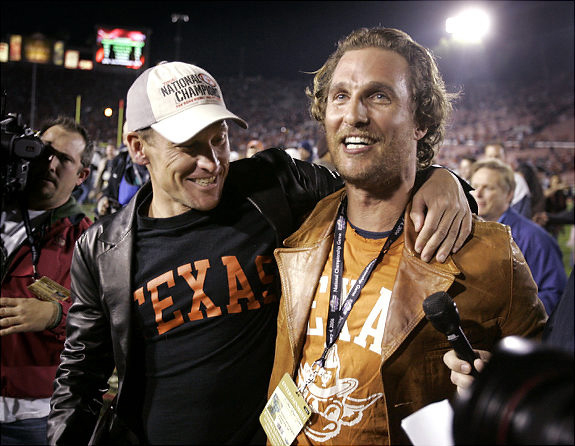 Lance Armstrong and Matthew McConaughey celebrate University of Texas’ win in the BCS National Championship football game. Lance Armstrong and Matthew McConaughey run, bare-chested, while listening to their iPods. Lance Armstrong and Matthew McConaughey run to stay in shape, while listening to their favorite tunes on their iPods. Lance Armstrong and Matthew McConaughey hang out together. The duo runs and exercises outdoors to stay in shape. Lance Armstrong and Matthew McConaughey run on the boardwalk in Miami as onlookers stare as they pass by. The two were on vacation in Miami. Lance Armstrong and Matthew McConaughey get ready for a run. The two guys were vacationing in Miami and staying in shape by runninig near the beach. Lance Armstrong and Matthew McConaughey hang out on the beach in Miami, where the two were on vacation. Armstrong and McConaughey both enjoy biking as well as running. Matthew McConaughey and Lance Armstrong hang out in Miami on the beach and enjoy the scenery. Despite the unpredictable weather in Miami, Lance Armstrong and Matthew McConaughey continue their run near the beach. Lance Armstrong and Matthew McConaughey were caught in a downpour while vacationing in Miami. The two guys, who both love to exercise, were running at the beach. Matthew McConaughey and Lance Armstrong take a dip in the ocean. The two guys are often seen biking, running and partying near the beach. Matthew McConaughey and Lance Armstrong hang out at the beach. The two are together so often, the tabloids and gossip sites are often speculating about the nature of their relationship. Lance Armstrong and Matthew McConaughey often hang out on the beach in Malibu, as well as vacation together in Miami and other locations. Matthew McConaughey and Lance Armstrong get ready for a bike ride in Malibu, California. Matthew McConaughey and Lance Armstrong take a bike ride in Malibu. The two are often seen running, biking and exercising together. Matthew McConaughey and Lance Armstrong meet up to take a bike ride. Both men are very health conscious and can often be found biking and running in Malibu. Matthew McConaughey and Lance Armstrong walk in Malibu after spending the day bike riding. The guy pals can often be found together at sporting events, the beach and nightclubs. 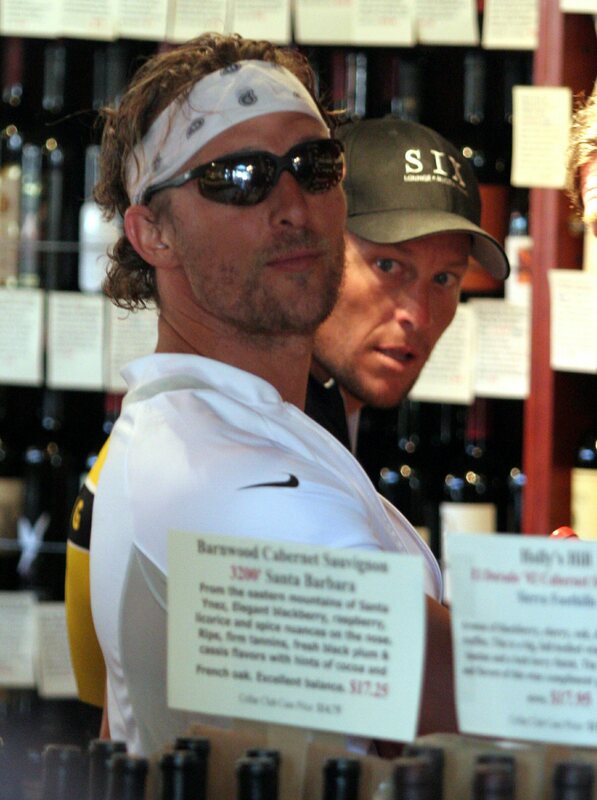 Matthew McConaughey and Lance Armstrong drop into a wine shop (presumbly to buy a bottle) after the two finished a day of biking in Malibu. Matthew McConaughey and Lance Armstrong take a look out the window of a liquore store. The best buddies spent the day biking near Matthew’s home in Malibu, California. Matthew McConaughey and Lance Armstrong definitely enjoy the nightlife. Here they have a few drinks after spending the day near the beach biking. 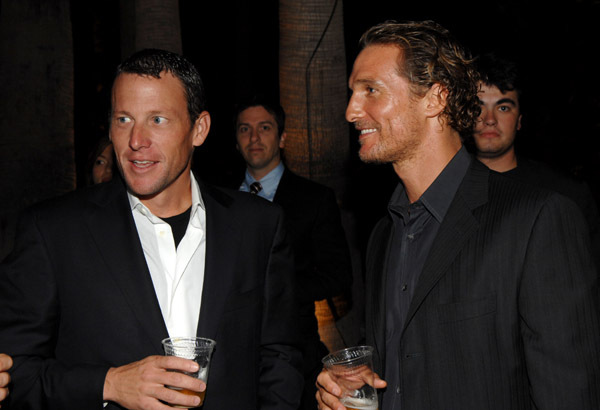 Lance Armstrong and Matthew McConaughey go out and have some drinks. The two look nice, dressed up in their suits. They are often seen at nightspots and events together, partying and having a good time. Matthew McConaughey and Lance Armstrong laugh and enjoy themselves before heading out for a bike ride on Pacific Coast Highway in Malibu, California. Lance Armstrong and Matthew McConaughey walk together after hanging out near the beach exercising. Both men stay fit by walking, running and of course, biking. 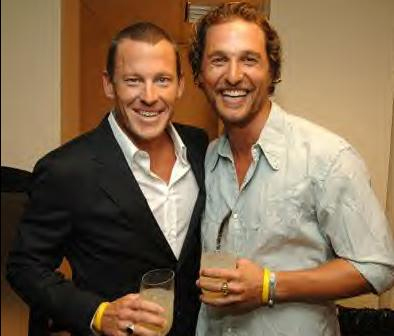 Pals Lance Armstrong and Matthew McConaughey enjoy a few drinks. McConaughey has a baby with Camila Alves, while Armstrong has been romantically linked to many women. Cyclist Lance Armstrong and actor Matthew McConaughey get ready to take a bike ride along PCH in Malibu. Armstrong has gotten McConaughey into the sport over the last several years. Matthew McConaughey and Lance Armstrong, along with others, bike along Pacific Coast Highway in Malibu. The area is a popular spot for biking, hiking, running and other outdoor activities. With the beautifully scenery and the beach, it’s a great location for outdoor fun. After some fun in the sun, Matthew McConaughey and Lance Armstrong come in from the water. The actor and cyclist spend a great deal of time at the beach. McConaughey has a home in Malibu. Lance Armstrong and Matthew McConaughey are stopped by a woman on the beach. After a day of surf, sun and sand, Armstrong and McConaughey hung out and had a few drinks. Matthew McConaughey and Lance Armstrong seem to be enjoying themselves at the beach. They often run or bike near the beach. But here, they are relaxing and enjoying the view, while taking an occasional dip in the water. Lance Armstrong and Matthew McConaughey run on the beach. Running on the sand is great exercise. The two guy pals listen to music on their iPods while going for a run.